Friday May 6th 1892 It was a very pleasant morning. I walked to town and Fanny came home with me to spend the day. Ott came for dinner. Fanny began my quilt. I helped with the work in the evening. Saturday May 7th 1892 We cleaned up the summer kitchen and done the other work. Will and I rode to town in the afternoon. I got a few things. I worked on my quilt in the evening. Will is forty-two years old today. 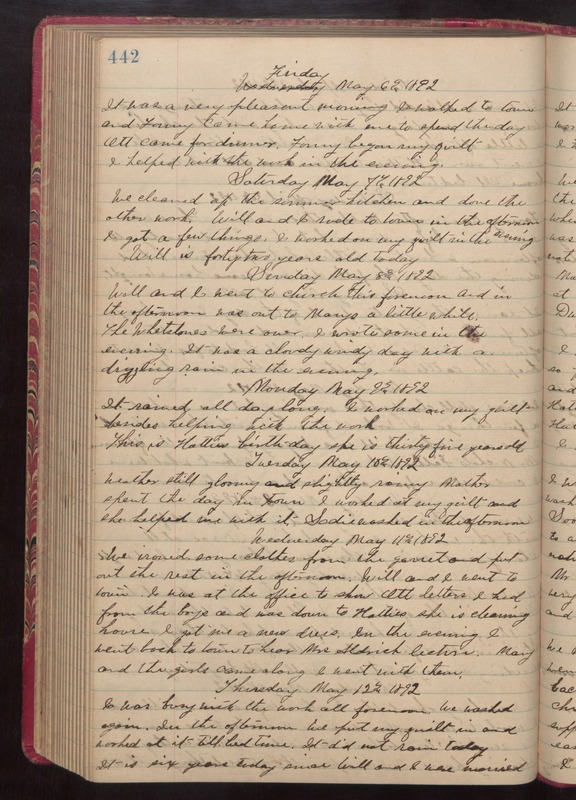 Sunday May 8th 1892 Will and I went to church this forenoon and in the afternoon was out to Marys a little while. The Whetstones were over. I wrote some in the evening. It was a cloudy windy day with a drizzling rain in the evening. Monday May 9th 1892 It rained all day long. I worked on my quilt besides helping with the work. This is Hatties birthday. She is thirty-five years old. Tuesday May 10th 1892 weather still gloomy and slightly rainy. Mother spend the day in town. I worked at my quilt and she helped me with it. Sadie washed in the afternoon. Wednesday May 11th 1892 We ironed some clothes from the garret and put out the rest in the afternoon. Will and I went to town. I was at the office to show Ott letters I had from the boys and was down to Hatties she is cleaning house. I got me a new dress. In the evening I went back to town to hear Mrs Aldrich lecture. Mary and the girls came along. I went with them. Thursday May 12th 1892 I was busy with the work all forenoon. We washed again. In the afternoon we put my quilt in and worked at it till bed-time. It did not rain today. It is six years today since Will and I were married.